There is hunting Fraser, which has a brown ground, and is usually worn during the day, and dress Fraser, which has a red ground and is worn in the evening. These are easily obtainable from most suppliers. 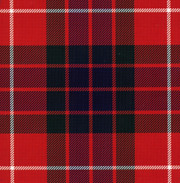 There is a range of Fraser Gathering tartans, designed for the Gathering at Castle Fraser in 1997, one with a green ground for day wear and two dress tartans, one with a red ground and one with a white ground. These were designed by Macnaughtons of Pitlochry in conjunction with Lady Saltoun , unfortunately Macnaughtons no longer seem to stock them. 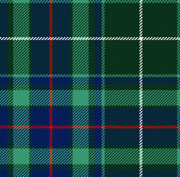 Knowing that there are various websites devoted to complete lists of tartans, I contented myself with listing the ones readily available in the shops, or which would be recognised as being Fraser tartan by anyone, and providing links to other websites which will give more information. It would not be correct to say that I do not recognise the ones I have not illustrated as being genuine Fraser tartan. I have no doubt that most of them are. Some of course are tied to a particular branch of the family (e.g. Lovat and Altyre), others are tied to a regiment such as the Fraser Fencibles or the 78th Fraser Highlanders, and should only be worn by members of the regiment. One (Wedding Dress tartan) was designed for a particular occasion. It would not be suitable to use any of them. You have, I think, to consider the reasons why you wish to wear Fraser tartan. The normal reason, and the reason why people wear their tartan in Scotland, is so that others may instantly recognise them as Frasers, at a gathering or Ball or whatever the occasion may be. This will only work if you stick to the common sets - Red Fraser and Hunting Fraser as shown in my website, and those particular sets in different colours, because although some other Frasers may know some of the less common ones, people of other clans almost certainly will not, so you will find yourself going about incognito! Do you want to be instantly recognisable or not? I myself would only wear the ones I have illustrated in my website, and on public occasions only the common ones. I do wear Fraser Gathering tartan (after I had a considerable hand in designing it! ), but generally only in private, because I wear my tartan to be instantly recognisable. I personally intensely dislike most white or yellow ground tartans and would not be seen dead in them! But that does not mean that others should not wear them if they wish to do so. I offer one more thought. 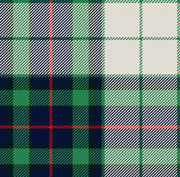 The usual red Fraser tartan obtainable in the shops uses pillar box red, cobalt blue and emerald green, and the effect is not, I think always very attractive. I think a much more attractive effect can be obtained by using a softer more corally or orangey red, a paler blue and a soft grass green, more like red Fraser Gathering tartan, or 78th Fraser Highlanders tartan. In the same way Hunting Fraser can be much more attractive if you use dark blue, dark brown and dark green, instead of the shades usually available. This has the advantage of being instantly recognisable as Fraser tartan. If you are planning to have tartan specially woven, it is something you might want to consider. Many of the 22 tartans listed in the World registry were invented long before my time, so who would I be to disown them? At the same time, if you were to ring my doorbell wearing a kilt of some of them, I should probably not know what tartan you were wearing! As a matter of interest, I have a silk Fraser tartan sash which is different from any of the 22 listed in the World Registry, but is still Fraser tartan! Incidentally, when I was young, dress tartans were red ground as a rule and Hunting tartans were green or brown ground ( for camouflage out on the hill). Now they call white ground tartans "Dress" and red just red. I objected to this when designing the Fraser Gathering tartan, but was informed that I was quite wrong, so meekly gave in, but I still believe that I am right and they are wrong! So if you want to wear one of the less well known ones, go ahead, but be aware of the pitfalls!